Waiting for the show jumping on the final day of a three-day-event when you are in a good position is always quite painful. I managed to fill the day with a few signing sessions for sponsors, and I joined most of my family and a gathering of friends, organised by Alice, for lunch in The Outside Chance Bar. I hastened to add I didn’t manage to eat anything, but it was good to see everyone for a brief distraction! The parade of competitors and horses at Badminton is a very traditional event, but is always something that I think the horses don’t need to do. It drags out their day and uses valuable energy. I was very lucky to borrow one of the Beaufort Hunt horses, he was quite a character and had been around the ring before with Paul Tapner, being snow-white it was also quite obviously not Chilli Morning which caused a bit of a laugh from the crowd, which was very welcome in the building atmosphere. It was obvious from the morning’s jumping session that the course was pretty difficult, however there had been a couple of clear rounds by particularly good jumpers. The afternoon session carried on in the same vein, with quite a few poles falling, fortunately I watched Nicola Wilson’s immaculate round on One Too Many, and I was determined to keep that vision in my mind. Chilli is always onward bound on the last day having been cross country and it took a few jumps to settle him down, overall he warmed up really well and felt a much fresher horse than he had 8 months previously in the World Championships. Going in to the ring knowing you have to jump a clear round to hold your place is never a great feeling but Ingrid’s clear round certainly put the pressure on. However I, in turn, knew that a clear from me would keep the pressure on Andrew Nicholson. Chilli jumped the first few fences particularly well and that help settle the nerves as I became hopeful that a clear round would happen. Apart from rubbing the second last fence he jumped as well as he has ever done, it is hard to explain the feeling of relief as he cleared the last. After my round it was great to see the relief on the faces of the team, and we all knew nothing else could now be done. I don’t like to watch the ones above, me so we all took ourselves around the corner to enjoy the moment, and thinking what will be. Amazingly it was not long before the crowd gave the game away and we realized that Chilli had won. What a fabulous feeling that was. Huge celebrations followed, sadly Lisa and Chris Stone were not there to share the moment. Chilli was taken off to Doping Control and the Press Conference was a very happy occasion followed by more celebrations at The Outside Chance. Not surprisingly none of Team Fox-Pitt were very keen to leave and Jackie, Oli and I got home eventually at 11pm. Chilli came out of his exertions well and looked fantastic on Monday, which was a huge relief. He has had a busy week including a parade at Wincanton, which he loved, obviously taking it in his usual relaxed way. He is now enjoying a nice holiday, he will have a month off before coming back into gentle work this Autumn. 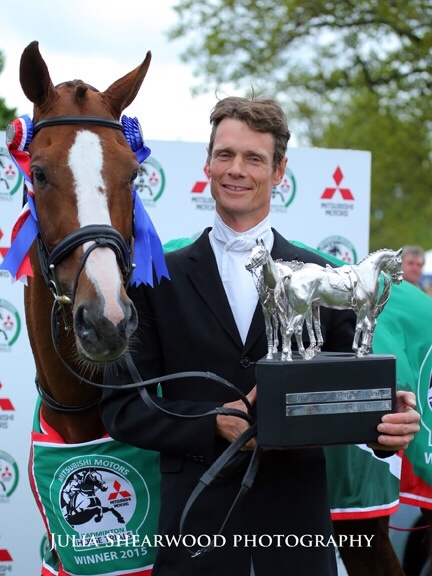 After much discussion with his owners and Performance Manager, Yogi Breisner, we have decided not to compete him this Autumn, and to save him for a 2016 Rio campaign. The idea is that he would do some CIC’s to show his form, but without any unnecessary wear and tear. He has competed in seven 3-day-events since he came to me in 2012, never finishing out of the top five, so we feel he has nothing to prove. Horse and Country TV will be showing the dressage, cross country and show jumping so do keep an eye on their programme scheduling.